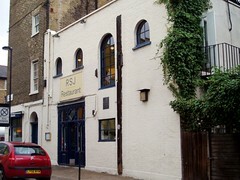 RSJ was a modern European restaurant with an extensive French wine list, not far from Waterloo Station. It has now closed and been replaced by a pan-Asian restaurant called Sticky Mango. A modern European restaurant with an extensive French wine list, on Coin Street, not far from Waterloo Station. This restaurant, on a corner with the busy Stamford Street, is nothing much to look at from outside, and combined with its name (a reference to the "rolled steel joists" used to reinforce the ailing building before it was fit to be reopened as a restaurant), doesn't inspire a great deal of anticipation. However, this would be a mistaken assumption, as once inside there's very little disappointing about the place. Ewan and friend visited in June 2008. The dining room used for lunch was the light airy upstairs room, though they have a number of others on the ground floor and in the basement which can be booked for larger parties. The place had the ramshackle feel of a country house, with the reception area not unlike that of a bed & breakfast. The host was charming and polite, and serving staff were friendly also. Bread came immediately upon arrival and they had no trouble providing tapwater. For lunch, there's a fixed price menu (three courses for £19 as of June 2008), but choosing from the a la carte isn't so very much more expensive. The daily menu has three starters for around £5 (including a soup of the day), then a longer selection of dishes which can be taken either as starters or as mains, followed by substantial meat-based main dishes, then a long list of desserts and cheese. Ewan's starter of mushrooms with a poached egg and hollandaise sauce was pretty much perfect, if you like mushrooms photo. It was served over a lightly toasted slice of bread, with a lovely runny egg. A very substantial starter at around £6. For my main, from the same section of the menu (a few pounds more in price, at around £9), the quiche of the day was served with some fresh rocket salad, and it was clear that this was just a larger portion as there were two slices. It was also mushroom-based (I wasn't paying attention when ordering, but at least I really like mushrooms) with stilton, and was just fine. Not perhaps as inspiring as the starter, but a very good lunchtime dish nonetheless. Unfortunately, we weren't able to try one of the very tempting looking desserts, but the cheese board was perfectly fine to share, with some very good cheeses (though the goat's cheese was a little bland, it improved greatly when eaten with some of the quince jelly provided). One final idiosyncratic feature I cannot help but point out is that though we declined coffee at the end of our meal, the final itemised bill came with "2 No Coffee £0.00" on it. We provided two cards, and they split the bill in two without even asking and no extra tip was requested beyond that included on the bill, which I found quite refreshing. Ewan's verdict: Good value European cooking, nothing too flamboyant, accompanied by the kind of wine list that encourages one to learn more about wine. Last visited by Ewan and friend, June 2008. Last edited 2018-04-07 14:08:57 (version 9; diff). List all versions. Page last edited 2018-04-07 14:08:57 (version 9).